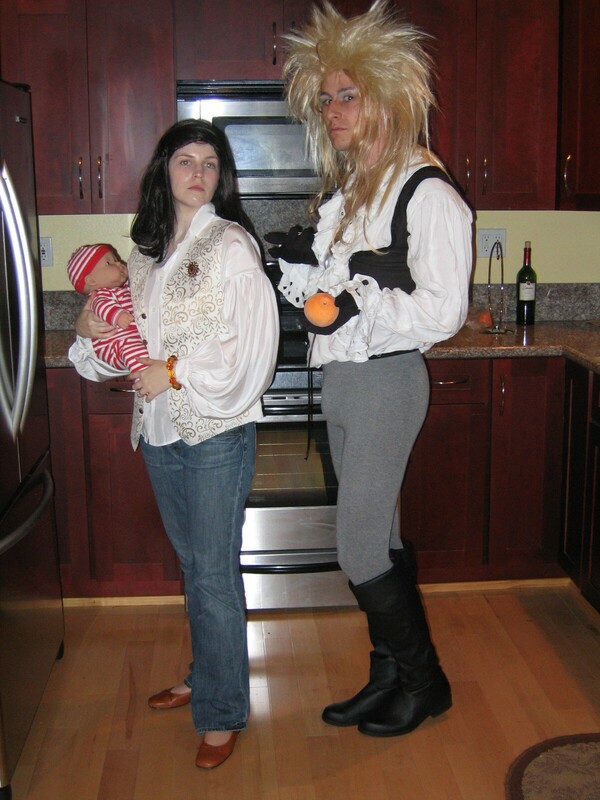 Yes, Dan and I dressed up as Sarah (Jennifer Connelly) and Jareth the Goblin King (David Bowie) from the 1986 Jim Henson movie, The Labyrinth. We love the movie and wanted to look as much like the characters as possible. I'll look for a picture from the movie for comparison. 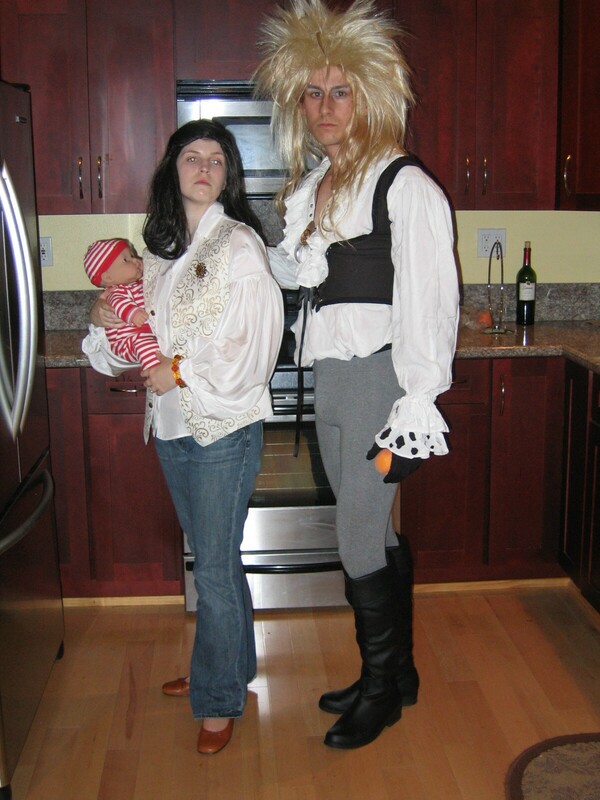 The costumes turned out really well and a few people at the party even recognized us immediately. Everyone else needed a little reminder. In case you're interested, the rest of the Halloween party pictures can be found in the "Halloween 2006" section of my photo album. I'm just about finished with my Halloween costume, and it's a good thing since Dan and I are going to Mike's 5th Annual Halloween Party tomorrow night. This evening I have to sew on some buttons and arrange some hair, but then I'll be done. In the past two months Dan and I have spent a lot of time searching for the right items for our costumes and putting them together. I'm so excited! We'll take some pictures tomorrow so that we can share all of our work with everyone. I've listed the basic components of my Halloween costume below. Can anyone guess who I'm going to be? "Any team I root for is ultimately doomed." I just remembered that it's Friday the Thirteenth. No wonder I had so much trouble today. I was reminded of this fact when I came across my diary entry from another Friday the Thirteenth - October 13, 2000. The thunderstorm outside is just icing on the cake. My plan was to take the 22 East to the 5 North, but there was so much construction on the 22 that I missed the (poorly marked) exit. So I tried to turn around at the next exit to try and get to the 5 North that way, but there wasn't a 22 West on ramp at that exit. My only choice was to get back on the 22 East. I went east until the 22 dead ended at the 55. I thought I could take the 55 South to the 5 North. Unfortunately the 55 South only gave me the option to get on the 5 South. So I took the next exit to turn around, but there was only a 5 South on ramp there. Does this sound familiar? I was getting pretty frustrated. I figured my last resort was to take the 405 South to the 5 North. But that that didn't work either. The 405 South merges onto the 5 South without the option of going north instead. At this point I had been driving for about an hour and I couldn�t believe how many wrong turns I had taken. The first right move I made was to take the next available exit, turn around, and get on the 5 North for the first time. I finally did get to Downtown Disney, but not before making a few U-turns to find the entrance to the parking lot. I don�t know if I�m a bad driver or just incredibly unlucky. Since I got home today I've watched Gilmore Girls, Project Runway, America's Next Top Model, and the X-Files pilot. Without TiVo this would not be possible. Dan went out of town today or else I would have Lost to add to that list. But I'll save it until he get's back next week so we can watch it together. My plan for the rest of the evening is to read a book until I fall asleep. A real indulgence. "The Gators have used the two-quarterback system to beat Southeastern Conference powers Tennessee, Alabama and LSU and improve to 6-0 for the first time since 1996. They also moved up three spots to No. 2 in the latest Associated Press college football poll - the program's highest ranking since December 2001." The Gators are ranked #2! 1989: At ten years old I saw "The Little Mermaid" for the first time. On a trip to Kansas for Christmas, my brother and I both got Ariel toys in our Happy Meals. I remember playing with them in the Jackson, MS hotel's indoor pool. 1990: At eleven years old I received the original video release of "The Little Mermaid" for Christmas. I remember going to the Disney Store with my mom to preorder it. This was in the pre-Amazon days. I still have that video. 1998: At nineteen years old I saw "The Little Mermaid" in the theater again when it was rereleased for a limited time. I can't remember who all went with me, but I'm pretty sure I dragged Kathe along. 2006: At twenty-seven years old I purchased the original DVD version of "The Little Mermaid" that Disney took its sweet time releasing. And now I'm watching one of my favorite movies on a Friday night while my fiance is asleep upstairs. I love "The Little Mermaid!" I just saw the Eragon movie trailer. I always look forward to movie versions of my favorite books and this looks like it might be a good one. "This will not end well. �Lost� will undoubtedly turn into an �X-Files� mess, perhaps losing original cast members and replacing them with brand-new, previously unseen survivors (the Cargoholdies?)." "Some mock Atlanta for winning only one championship during the run � and that came with a little help from beleaguered Indians closer Jose Mesa. But it�s difficult to disparage a franchise that gives itself a shot at a title every season." For the first time in sixteen years the Braves won't be making an appearance in the postseason. I've always tried to be optimistic when the baseball playoffs roll around, but this year I don't even have a reason to try. This is so depressing. Only the Dodgers are keeping the postseason from being completely uninteresting this year. And since Greg Maddux is now on our hometown team I have one last remnant of the Braves to hold on to. It's quite a stretch since he hasn't played on the Braves for a while, but maybe my Cubs t-shirt will bridge the gap. The Dodgers/Mets series starts on Wednesday afternoon so I'll make sure to TiVo the game. If I don't find out the score before I get home from work I might actually watch it. Now that it's October I can start writing about Halloween. Dan discovered carvable fake pumpkins at Michael's a few weeks ago and now we have five artificial jack-o-lanterns in our front window. Do you recognize the faces on the far left and far right? 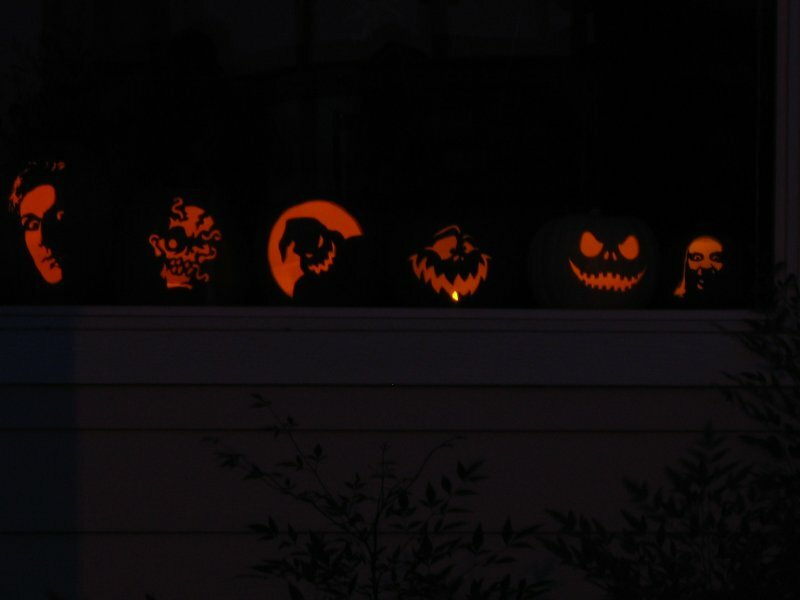 That's right, Dan carved our images into two of the pumpkins! Frightening, aren't they? We're obviously separated by denominational differences. Charlie Brown, "It's The Great Pumpkin Charlie Brown"